The watch can run for up to six months in total darkness, so having it live in your pocket some of the time may not be as problematic as it sounds. I’m not entirely sure why there isn’t more of a hullabaloo about this movement — maybe it’s because it isn’t shown during editorial meetings, but rather placed outside Citizen’s booth at the Baselworld 2018 event, where it is easy to miss if you happened to be just walking by, or rushing from one appointment to the next. 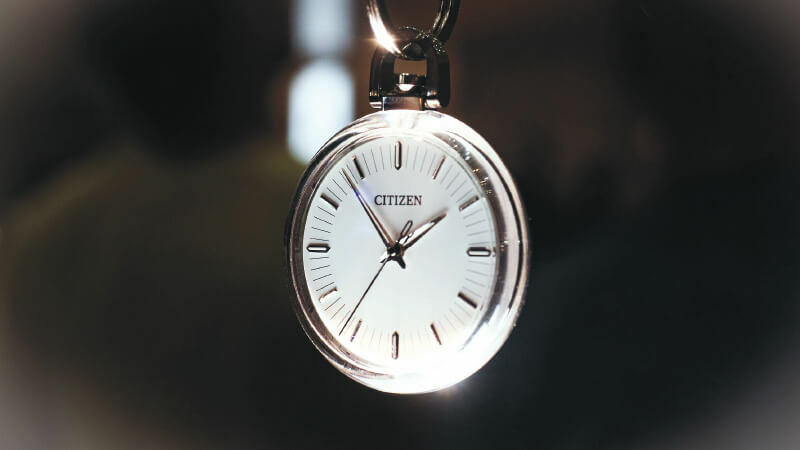 However, it’s easily one of the most remarkable developments of Baselworld 2018 and certainly one of the top technical watchmaking stories of the year: Citizen has developed a light-powered, eco-drive movement accurate to just ±1 second per year. 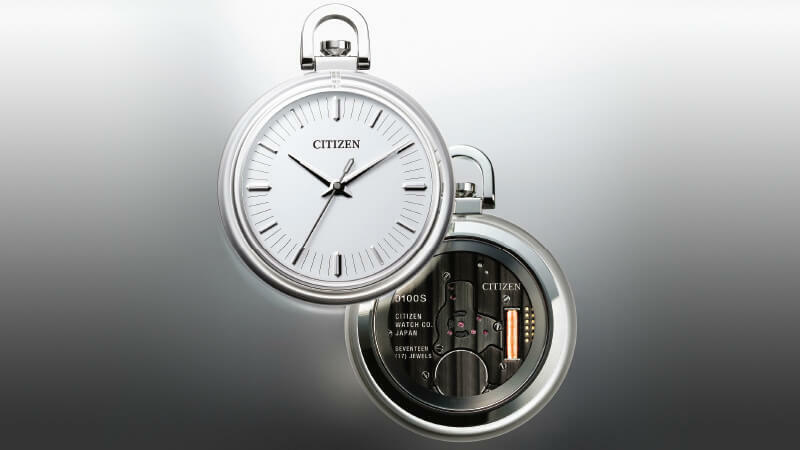 The movement is cased in a pocket watch, but Citizen says this not-for-sale prototype is a harbinger of things to come and that we can expect to see the technology in regular production watches in 2019. The pocket watch is pretty compelling — the case is synthetic sapphire, and the diamond-like carbon-treated movement is visible through the transparent back. Honestly, I’d give my eyeteeth to own it as it is, although I suppose a solar-powered pocket watch may not be the hottest idea. However, it may actually be okay in this instance — Citizen says the watch can run for up to six months in total darkness, so having it live in your pocket some of the time may not be as problematic as it sounds. There are several key design points. The first, and one of the most important, is the frequency — a typical quartz watch runs at 32,768 Hz, but caliber 0100 — the name refers to Citizen’s 100th anniversary, which is this year — runs at a much higher frequency: 8.4 Mhz, or more precisely, 8,388,608 Hz (vibrations per second). That’s considerably faster than the Omega Marine Chronometer from the 1970s with a special lens-shaped crystal, and vibrated at 2.4 Mhz. Citizen’s own Crystron Mega, from 1975, was rated to ±3 seconds per year, at 4.19 Mhz. Bulova’s Precisionist quartz movement runs at 262 KHz, or 262,144 Hz (interestingly, Bulova is owned by Citizen, and the company obviously sees a future, smart watches be damned, in autonomously accurate high frequency quartz watches). From what I’ve read, you can get off-the-shelf quartz oscillators with frequencies in outlandishly high ranges — 300 Mhz, anyone? — but I suspect such high frequencies would badly tax current battery technology. The second is the cut of the crystal; rather than the usual tuning fork configuration, Citizen is using an AT-cut crystal, cut from a larger crystal to a different orientation than conventional tuning fork crystals. The cut’s orientation produces a better resistance to temperature variations (the main cause of inaccuracy in quartz oscillators), and as the vibrations are smaller in amplitude than in a tuning fork crystal, there’s less variation in rate due to physical shocks and changes in position as well. There seems to be some sort of software adjustment for temperature rate too, although a press release is a little less specific on this point. In any case, when this technology becomes commercially available, all and any of us whose hearts thrill to the notion of autonomous — not global positioning system connected nor radio controlled — high-precision timekeeping technology ought to be happy as a clam (an expression I’ve never understood, as every clam I’ve ever seen has looked morose at best, but you get the idea). I’ve never in my life stood in line for any new technology product but by gum, I think I’d stand in line for this one. Visit Citizenwatch.com for a wider look at their work, and scratch your head, as I did, to find out this achievement isn’t highlighted more prominently on their website; if I were them, I’d have laser etched the press release in incandescent letters 10km across the moon’s surface. Hodinkee is the pre-eminent resource for modern and vintage wristwatch enthusiasts. Through in-depth reviews, live reports and dynamic videos, Hodinkee is bringing watches to the 21st-century audience.